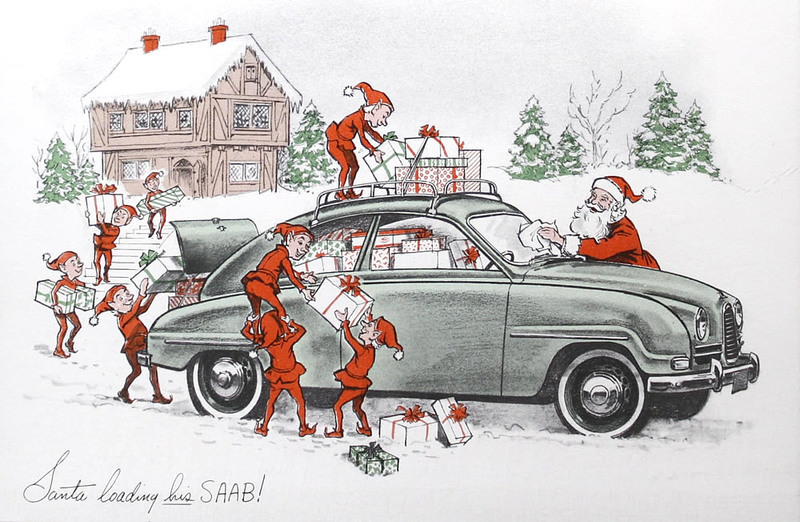 Many car manufacturers promote their cars with winter holiday greetings and SAAB played their part in the late 1950s. Most cars these days can handle winter driving conditions just fine but things were probably different 60 years ago. Saabs were made in Northern Europe and many early videos show how well they handled in cold and snowy conditions. The Saab 93 was introduced in 1955 and was made for 5 years until it was replaced by the Saab 96. It was praised for its roomy interior so definitely the perfect vehicle for Santa to haul around presents while his reindeer were taking a break. Santa has a long history in Western culture and is linked to Christmas, Yule and all the way back to Germanic paganism. 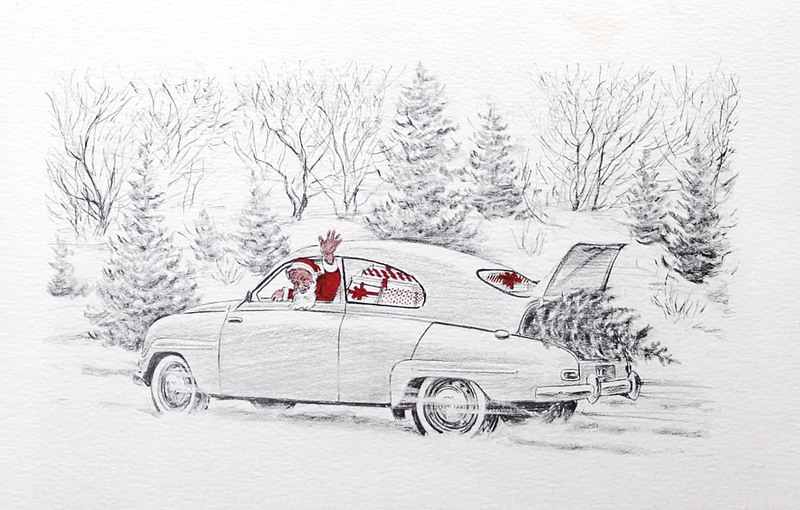 But whatever holiday you celebrate, these holiday greeting cards with Santa, the elves and the Saab 93 are appropriate for everyone and will bring a smile to the face of any car enthusiast. Images from these greetings cards are from the Z. Taylor Vinson Collection stored in the Hagley Museum and Library in Wilmington, Delaware in the USA. It appears this blog is not maintained anymore and the images are missing so here are a few quotes from the article. 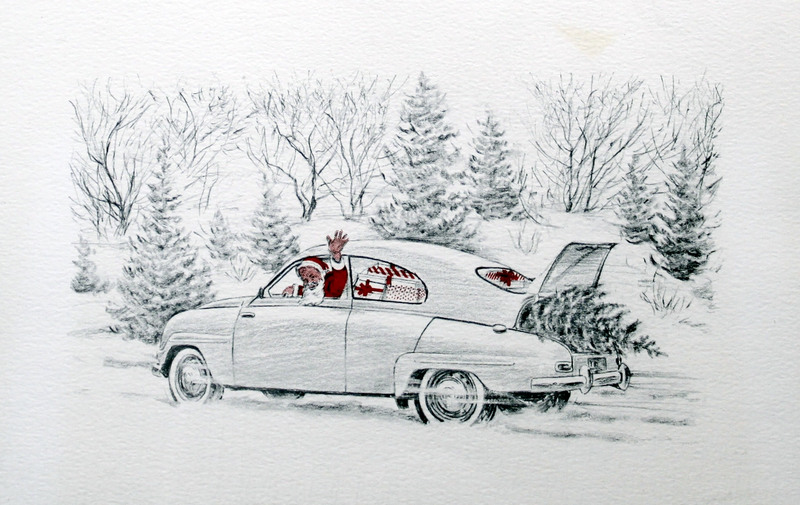 During the late 1950s, the Swedish automaker Saab Automobile AB came up with a fun idea for its Christmas cards. Saab apparently asked the following question: what kind of car would Santa Claus drive? If one were to take Saab’s word for it, Santa would be the proud owner of a Saab 93. 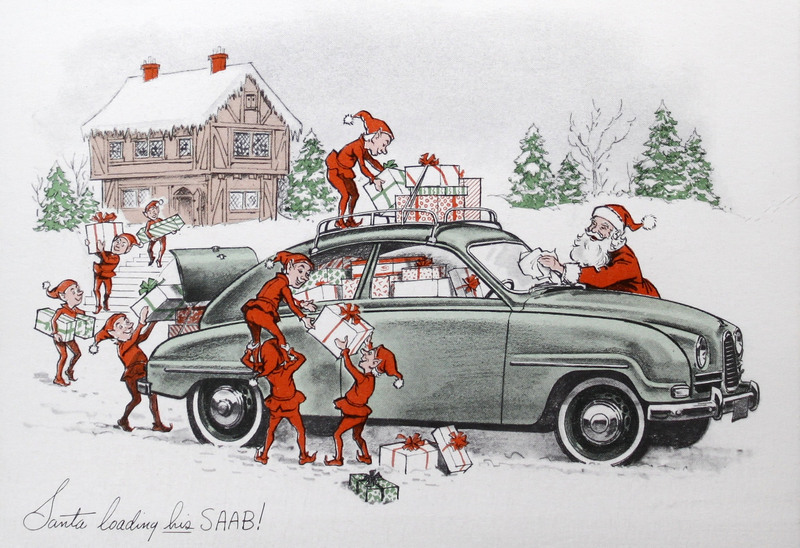 In an effort to advertise the car’s reputation for reliability and durability, Saab presented the 93 as Santa Claus’ car of choice in its advertising Christmas cards during the late 1950s. Although done in a light-hearted vein, there is arguably more kernel of plausibility to it. If one were to follow Saab’s logic, because jolly old St. Nick lives at the North Pole, an isolated region noted for extreme cold, heavy snow, and a lack of good roads, it seems only reasonable to believe that he would want a car that is reliable, durable, and designed for operation in harsh northern climes. If so, Saab certainly had a good case portraying Santa Claus as the proud owner of a 93. Click the thumbnails below to open large versions of these images to use as desktop wallpaper on your computer.